Julian Bond has remained committed to equal rights for all Americans and the power of non-violence in creating social change since the significant role that he played in the Civil Rights Movement during the 1950’s and 1960’s. When Horace Julian Bond was born in 1940 in Nashville, Tennessee, his father, Horace Mann Bond, was a prominent educator and academic, serving as president of Fort Valley State College. 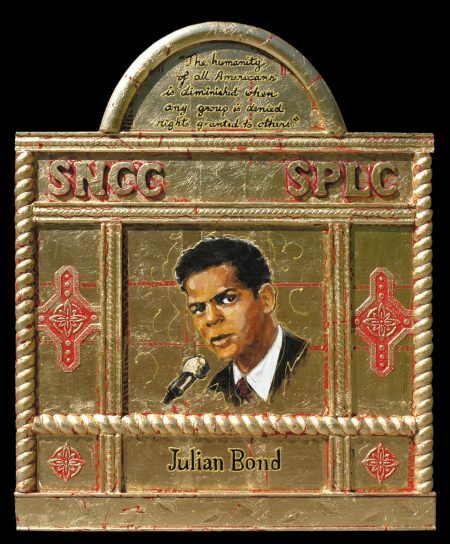 At an early age, Julian would have heard discussions around the dinner table with such celebrities as Paul Robeson and W.E.D. DuBois when they visited the college president’s home. In 1945, the family moved North when Julian’s father was appointed the first African-American president of Lincoln University in Pennsylvania. Later he became Academic Dean at Clark-Atlanta University in Atlanta, Georgia. Julian graduated from the George School, a Quaker preparatory school near Philadelphia, Pennsylvania. He then went on to attend Morehouse College. It was at this all black college that his dedication to civil rights took hold when he joined others in organizing The Committee on Appeal for Human Rights. This student run organization sponsored non-violent demonstrations, leading directly to the integration of Atlanta’s theaters, parks and restaurants. In the spring of 1960, Bond joined other college students in the formation of the Student Non-violent Coordinating Committee (SNCC). He quickly became its communications director. He led voter registration drives throughout the South on behalf of SNCC, and in 1961, he left college to devote more time to the Movement. He became the editor of a new protest magazine, The Atlanta Enquirer . Ten years after having dropped out of Morehouse, he returned and earned his degree in English. As just a young man, he ran for and won a seat in the Georgia State legislature. But his outspoken stance against the Viet Nam War caused the legislature to deny him entrance. After being denied his seat, after 3 elections, the United States Supreme Court ruled the actions of the Georgia legislature unconstitutional. Finally, he was seated in 1967 and served until 1974 when he ran for the state senate. He won that election and served in the senate until 1987. In a hotly contested race for the United States Congress, he lost to his longtime friend and former SNCC activist John Lewis. Lewis has held that seat ever since, having been re-elected 13 times. After his political career, Julian Bond has continued to devote himself to the ongoing struggle for human rights in a variety of venues: From1998-2008, he was chairperson of the NAACP. He was an early supporter of the Southern Poverty Law Center (SPLC) and served as its president. He narrated the PBS documentary, Eyes on the Prize, which recounts the struggles and successes of the Civil Rights Movement. For almost 20 years, (from 1980-1997) he hosted America’s Black Forum and continues to be interviewed by national news agencies because of both his eloquence and his knowledge of the history of the Movement. He puts his voice and insight to work as a college professor, having taught in several Universities and currently as Distinguished Professor in Residence at American University in Washington, DC.